Specially designed to promote optimal colon health. Comes in convenient capsule form - No bad tasting powder drinks! Contains psyllium, flax seed, cape aloe, black walnut, cascara sagrada, spirulina, senna leaves, fennel seed and many more helpful herbs. Aids in detoxification of the colon and regularity. Healthy colons absorb nutrients better, increasing the effectiveness of other food and supplements you might be taking. Recommended to be used just once or twice per year. Less expensive and more complete than other colon cleansing products. The buildup of waste inside your colon can prevent the absorption of vital nutrients. 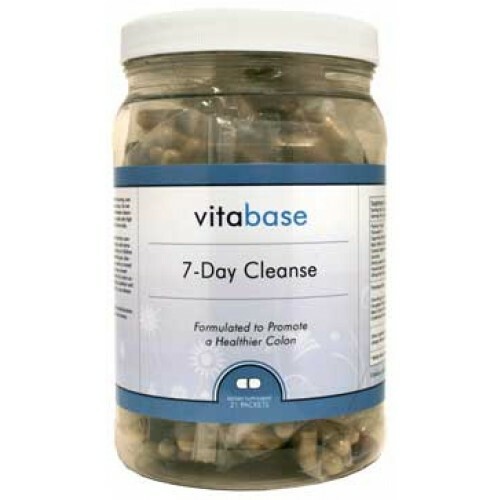 Before initiating a nutritional regimen, ensure that your intestinal system is working normally with Vitabase's Colon Cleanse. 7 Day Colon Cleanse is a completely natural colon detoxifier that helps cleanse the digestive tract and reestablish regularity. The ingredients of 7 Day Cleanse have been selected to be gentle yet effective. They include cascara sagrada, senna, cape aloe, and flaxseed oil. Psyllium is a high fiber herb included that is beneficial for absorbing body toxins. African bird pepper is included for its soothing effects. Convenience is an important factor when selecting a colon cleansing product. Many other colon cleansing supplements are in the form of powder and can be a challenge to ingest because of their taste and texture. Finally, if you compare the cost of this product to other brands, you will find that other products can be priced as high as $50-$60. Why spend more for a product that is significantly less effective? As a dietary supplement, take one (1) packet mid-morning, one (1) packet mid-afternoon, and one (1) packet at bedtime for seven days. Do not exceed three (3) packets daily. Allow three (3) to four (4) weeks between cleansing cycles. This product should be taken in conjunction with a sensible diet high in fresh fruit and vegetables and six (6) ounces of water eight (8) times a day. Do not exceed recommended dose. Read and follow directions carefully. This product contains cape aloe (Aloe ferox), cascara sagrada, and senna leaves. This product is not intended for pregnant or nursing mothers or children under the age of 18. Do not use this product if you have abdominal pain, diarrhea or loose stools. Do not use this product for more than one week or exceed the recommended daily dose. Rectal bleeding and/or failure to have a bowel movement after the use of a laxative formula may be an indication of a more serious condition. Should this occur, or if you have a known medical condition and are taking medication, consult your physician prior to taking this or any dietary supplement.